Go hunting for treasure in the historic Mexican empire in Aztec Power, a 5 reel, 25 payline video slot powered by Novomatic. Available on desktop devices online, it comes with a bonus feature that awards 20 free spins with a dynamic multiplier that starts at 2x. Play from between 50p and £50 per spin. Novomatic video slots aren’t usually treats for the eyes and ears. The bright and bold design of Aztec Power is pretty good though. Joining the lower value A to 10 symbols are head dresses, knives, pyramids and the Aztec warrior who is the top payer, awarding 100 times your stake if you land 5 on a payline. The gold medallion is the wild, replacing everything apart from the scatter. 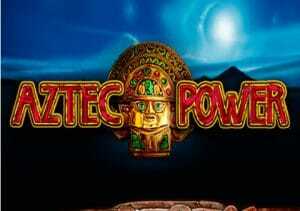 The likeliest route to accumulating plenty of treasure in Aztec Power comes via the Power Line feature – to trigger it, you’ll need to land 3 of the ornate, gem encrusted statute symbol which is the scatter, on reels 1, 3 and 5 on the same spin. You won’t be awarded any cash but you will receive 20 free spins, complete with the Power Line extra. This occurs on payline 1 only. If you don’t hit a winner on payline 1, a multiplier, starting at 2x will increase by 1. These increases continue until you land a winner on payline 1 before reverting back to 2x. For once, you won’t be hoping to hit a big winner early on here. Go winless for a while and then land a big win with a big multiplier and some fantastic results are possible here. At the end of the feature, the current multiplier is applied to your current bet, further adding to your winning opportunities. The variance here is in the medium range. The recipe is a familiar one for a Novomatic powered game – expect relatively simple design and features with payouts that pack a decent punch. Aztec Power fits that bill nicely. Get lucky with the Power Line and Aztec Power can deliver plenty of south American treasure. If you like the theme, Gonzo’s Quest by NetEnt is worth playing.